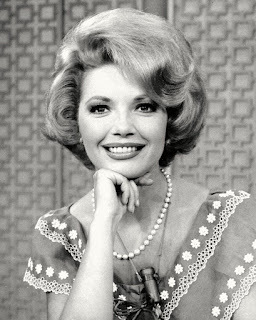 How are Barbara and Frank connected? Hey, this is June--so how can this be the May 2015 edition? Well, things got busy at the Cafe last month because of a couple of blogathons. We got a little behind schedule! For those who have never played this game, you will be given a pair of films, TV series, or performers. Your task is to find the common connection. It could be anything--two stars who acted in the same movie, two movies that share a common theme, etc. As always, don't answer all the questions so others can play, too. There is a single best answer for each question. 1. Barbara Eden and Frank Morgan. 2. Barbara Stanwyck and Dyan Cannon. 3. Cary Grant and Robert Loggia. 4. Sean Connery and Tyrone Power. 5. Janet Leigh and Elizabeth Taylor. 6. Rod Taylor and Malcolm McDowell. 7. Fred Astaire and Peter O'Toole. 8. The TV series Gunsmoke and the movie House of Dracula (1945). 9. Rod Taylor and Peter Lorre. 10. Anita Ekberg and Jean Peters. 11. Barry Fitzgerald and Bill Bixby. 12. Penny Singleton and Robin Williams. 13. Toshiro Mifune and Yul Brynner. 14. Will Smith and Vincent Price. 15. Albert Finney and Thunderball (this one is a stretch). 3. Both played reformed thieves in To Catch a Thief and T.H.E. Cat. 6. Both travelled through time, in The Time Machine and Time After Time. 13. Both saved villagers from thieves, in The Seven Samurai and The Magnificent Seven, the latter a remake of the former. Well done, Mr. Hartzog! You've got this edition off to a fast start. 12. Both played comic strip characters -- Penny as Blondie, and Robin as Popeye. Right on all three. I see that the big brains are out and about today! 15. Both appeared in Murder on the Orient Express, detective and suspect. Bill, I thought that was a tough one, but you got it! 4. Power's ex, Linda Christian, was the first Bond Girl - on tv? That's not the one I thought of, but it's maybe better! Still, there's another more obvious connection. Both guys had starred in a remake of one of their earlier films? Love is News '37, That Wonderful Urge '47. 4. Both appeared in adaptations of Agatha Christie, Murder on the Orient Express and Witness for the Proscecution. Here's a recap. The following questions have not yet been answered: 1, 5, 7, 9. and 11. There have been some excellent correct answers to 4--but there's still another answer lurking out there, too. 9. Both appeared in Hitchcock films, The Birds and The Man Who Knew Too Much. 5. Both were Little Women. Or 9. Both bird titled films. 7. Petulia Clark. 1. Both played two parts in the title role, Jeannie and Oz. There's a much better connection. 1. 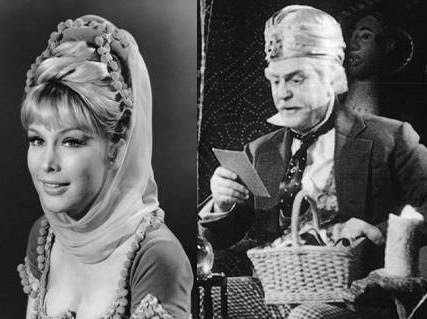 Barbara Eden was in Off to See the Wizard, Frank Morgan was in The Wizard of Oz. That's better than the connection I thought of! I am impressed. There's another one involving OZ and a Barbara Eden movie. This a long shot (pun intended) as I haven't seen 'Going My Way' for years but I think I remember a scene where one of the priests was shot with a sling shot by one of the choir boys. Bill Bixby was a choir boy, he shot the bishop using a slingshot during one service and was kicked out of the choir. Maybe not the answer to 11 but a funny story never the less. That is a funny story, but I don't think a Bill was in GMW. But he and Barry were in movies based on works by the same author. I didn't think Bill was in GMW, but the sling shot scenario was similar even if Bill's was a real life story instead of a reel life one. This quiz is certainly more difficult than usual.....well done. 1. Five Weeks in a Balloon. David, very good! You're right on both counts. The connection for #1 hot air balloons: Barbara in FIVE WEEKS and Frank in OZ. Agatha is indeed the common link for #11. Still looking for answers for 4, 5, 7, and 9. The last one is pretty difficult--only because it's not a giood connection. #7 involves an actress. Not the ones I had? 4. Leprechans. 5. Lassie - tho I didn't put that up. 7. Petulia Clark. 9. The Birds/The Raven. So sorry! I missed those! You are right on all four of the connections. I thought the Petulia Clark one was pretty hard. 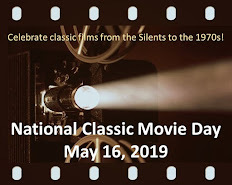 Thus, my smart movie and TV friends, that closes out this edition of the Movie-TV Connection Game. There will be another later this month to get us back to the once-a-month schedule. Excellent quiz, difficult which is good. Thanks! DVD Review: Thunderbirds (on Blu-ray) Are Go! Is There Really a She-Wolf of London?